Despite the high number of publications regarding pyrolysis of electronic scraps, there have not been many attempts to correctly understand the degradation mechanisms of organics. Hence, it is a challenge to identify the optimum parameters that can benefit its metallurgical recycling and especially the recovery of technological elements. 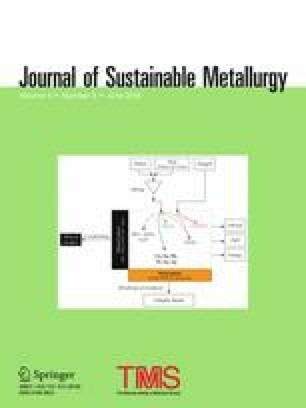 This article refers to a detailed analysis of the degradation mechanisms during slow pyrolysis as well as its deflection under fast heating speed. The analysis was made based on continuous off-gas analysis by Fourier transform infrared spectroscopy (FTIR), kinetic analysis on slow pyrolysis and measurement of total carbon (TC), total organic carbon (TOC), and elemental carbon (EC) in solid products at different pyrolysis temperatures. Results have evidenced that degradation of organics in pyrolysis of PCBs takes place in at least three different stages, which are driven by different reaction mechanisms and kinetic conditions. In addition, fast pyrolysis has shown to be beneficial if operated above 600 °C, where high-quality syngas is produced, containing elevated concentrations of CH4 and H2, and a lower concentration of H2O(g) compared to conventional pyrolysis and fast pyrolysis at lower temperatures. This study is supported by the cooperation project RessourcenKolleg.NRW, funded by the North Rhine-Westphalia Ministry of Science. Special thanks to Prof. Flamme for the constructive discussion and for providing the test material used for this study.